One of our favorite traditions in our home is celebrating Valentine’s Day with our kids! I remember the first year we had two children on Valentine’s Day. My husband brought us all teddy bears and put them on the couch for us to find that morning. It was so sweet, and we have decided to celebrate Valentine’s Day with our kids every year. I have added a new color-by-number pack to my little collection! 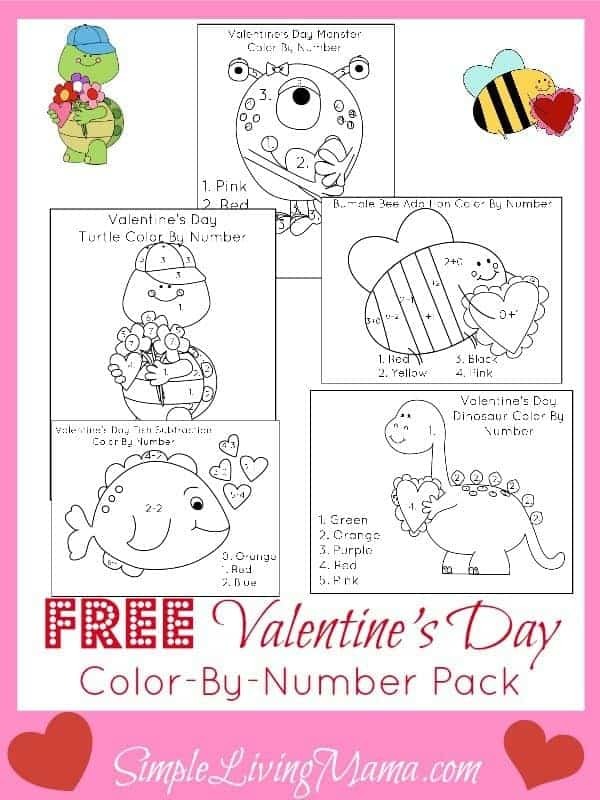 Today I am offering free Valentine’s Day Color By Number sheets! This pack contains 5 sheets; 3 are regular color-by-number sheets, 1 is an addition color by number, and 1 is a subtraction color by number. These sheets are really easy and ideally suited for ages 3-5. We love the cute little Valentine’s Day characters. My kids’ favorite, by far, is the fish! We love using these crayons or colored pencils to fill in our color by number pages. My favorite time to pull out the color by number pages is during our morning time! The kids can be occupied with a quiet activity while I’m reading and it works out wonderfully most of the time! If you want to get your FREE Valentine’s Day color-by-number pack, just head on over to the shop! Need some more ideas for Valentine’s Day Activities for Kids? Valentine’s Day Heart Tic-Tac-Toe – This super cute and easy craft is perfect for kids to make and then play a little game. This would also be a super cute activity to make and give out with Valentine’s Day cards! Valentine’s Day Activity Placemats – If you’re planning a Valentine’s Day party, these Valentine’s Day placemats are absolutely adorable and would be perfect for a table activity! Counting and Sorting Hearts – If you have preschoolers or toddlers, you may want to set up this adorable Valentine’s Day activity for them. Work on fine motor skills and counting skills at the same time! Rose Scented Playdough – My kids love play with play dough. Scented play dough is even more fun! Try this for a great sensory experience. 50 Valentine’s Day Activities for Kids – Need even more Valentine’s Day activities for kids? This post is full of them! These are so cute! Thank you for sharing! !